I have just retuned back from a weeks holiday in Egypt, which means that I am flaunting a bit of a tanned face which means I have had to switch up my everyday makeup routine to emphasise this. So, I thought I would show you a little rendition in this video of how I have been wearing my makeup since I have been home. If you want to view the video on YouTube rather then on my blog, simply click on the YouTube button in the bottom right hand corner and it will take you directly to YouTube so you can watch it there. I'f love for you to give it a thumbs up and click the subscribe button if you enjoyed it! Don't forget to make this look your own. This is just how I personally like to do it. If I was doing a day to night thing, I would take a brown kohl eyeliner with me and run it along my upper and lower lash line, and use my finger to smudge it out. 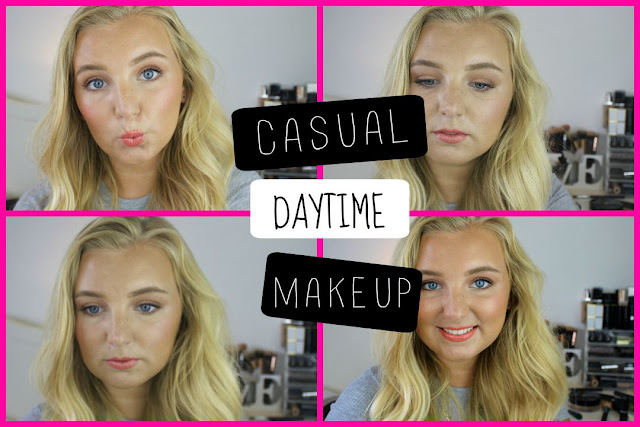 Super easy and a lovely way to transition this into more of an evening look! I hope you enjoyed the video, please give it a thumbs up by clicking the 'like' button at the bottom of the video, and click subscribe! It's totally free and you can get notifications of when I upload a new video straight to your phone! If you recreate this look, don't forget to upload it to Instagram and Twitter and tag me in it (@alystephens for both) so I can see it! For my last post on mastering the strobing trend, click here.